This is a project I’ve had in mind for quite some time; as a kid, I collected MAD Magazine, and I still have a subscription. And, of course, MAD has been a big part of Kittysneezes since the beginning. But I’ve long considered doing an occasional series where I review every issue. Though I haven’t quite decided if I want to go chronologically or not (I’m definitely leaning that way), either way, the obvious place to start is MAD #1. While I’ve got most of the issues, there are a few I’m missing — thankfully, the Absolutely MAD DVD-ROM fills in most of the gaps quite nicely. This is one of the handful of issues I don’t have. (Probably unsurprisingly; MAD #1 goes for quite a bit of money.) But it’s always been relatively easy to find a reprint; it is part of comics history after all. Perhaps the most interesting thing is that while MAD #1 is quite a bit different than what MAD would eventually become, even compared with the other 22 comic book issues, so much was already in place. Harvey Kurtzman‘s voice was clear from the first page, from his idiosyncratic way of writing and that every story is placed in a “department.” But it wouldn’t be for a few more issues until Kurtzman would start parodying specific subjects. In MAD #1, the parodies are of genres. The book, after an introduction from the editor, opens with the horror parody “Hoohah!” (All of the early titles ended with an exclamation point.) 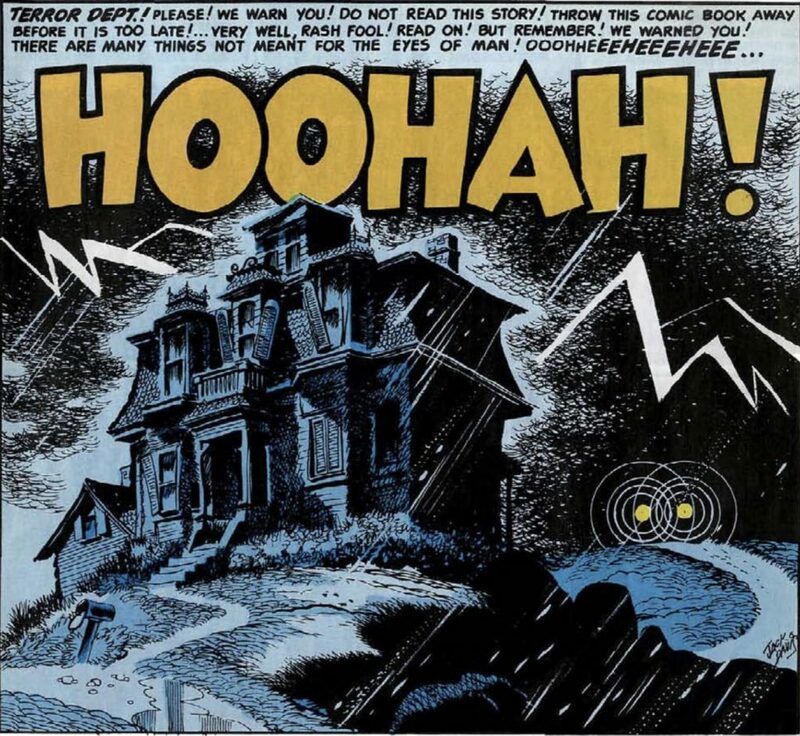 Featuring art by MAD staple and one of EC’s best horror artists Jack Davis, “Hoohah!” is a simple tale of a couple stranded in a thunderstorm by a haunted house. Like most EC horror comics, it features a twist, but you can somewhat tell that Kurtzman himself was never a fan of the horror books. “Hoohah!” is a bit too generic to truly be one of the greats, though that’s not to say it’s bad. Davis’ art is outstanding as usual, including a few solid gags — not least of which when Kurtzman predicts Scooby Doo over 15 years early. 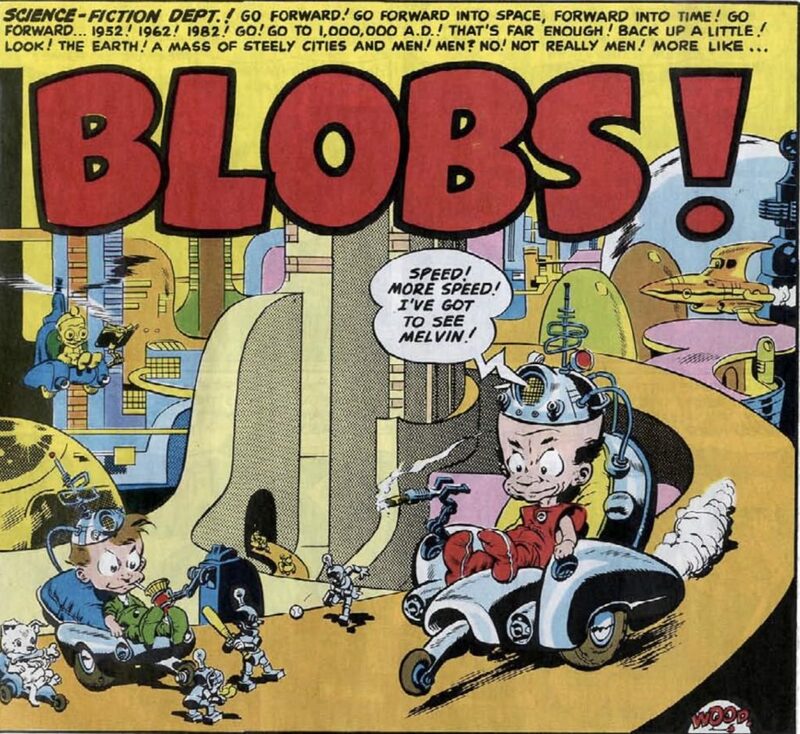 Though a great story, “Blobs” feels somewhat out of place for MAD. Though the last page is expertly rendered, the ending is slightly undermined by the narration confirming the obvious. Following “Blobs!” is two forgettable prose pieces, included due to postal regulations. (A comic had to feature a certain amount of prose to fall under the cheaper rates for mailing.) 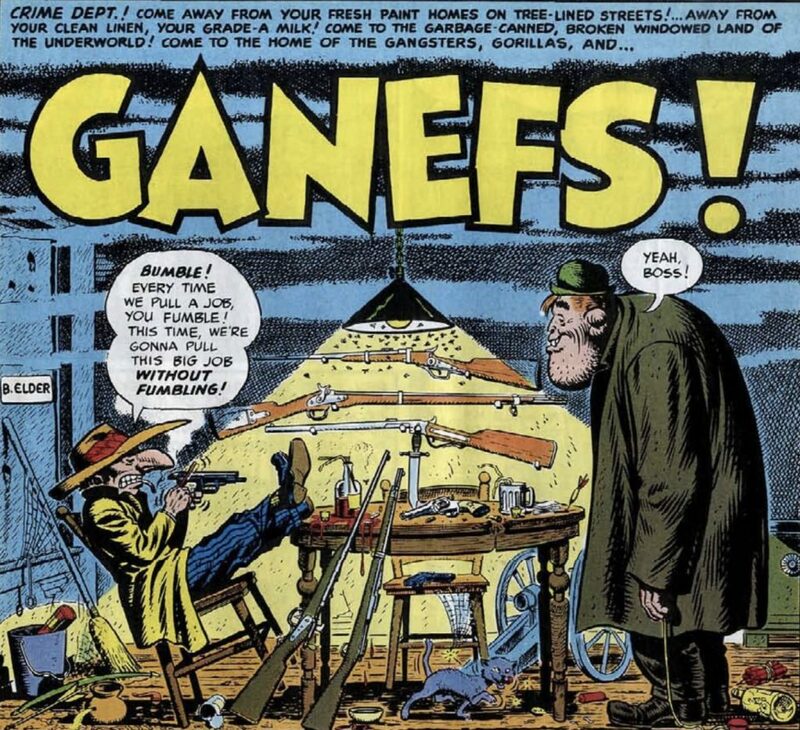 But next is “Ganefs!,” the riff on crime comics illustrated by Will Elder, who collaborated with Kurtzman until the end of Kurtzman’s life. 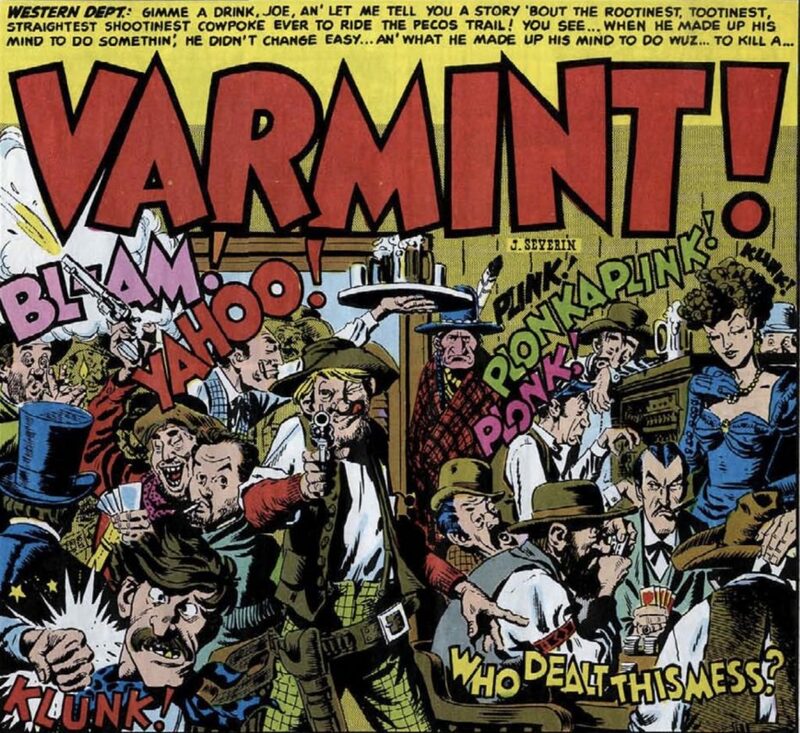 The issue closes with one of the few John Severin contributions to MAD, “Varmint!” And, like the previous stories in this issue, Kurtzman chose the artist in the EC stable known for his skills at illustrating westerns. And, like “Ganefs!,” “Varmint!” also feels like what MAD would later become. No matter how strange it is to read Severin in MAD, given his long allegiance with Cracked, “Varmint!” makes clear that had Severin stuck with MAD, he’d have been a great boon. As “Ganefs!” does, “Varmint!” features a simple story with similar structure ending in a clear punchline. 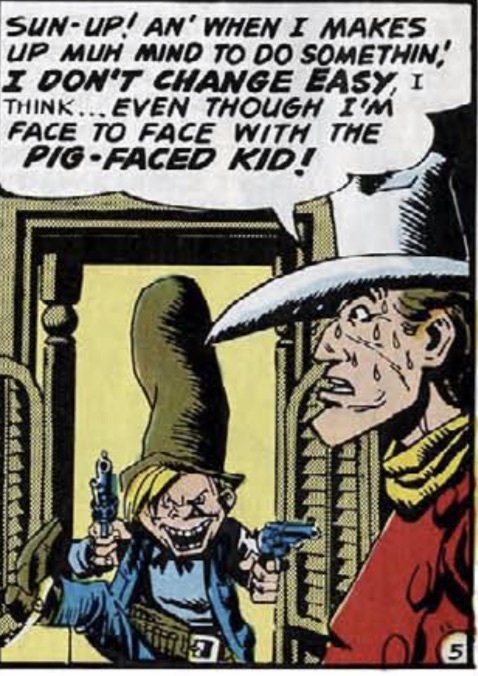 And, uh, is it just me, or does the Pig-Faced Kid look kinda like Cracked‘s Sylvester P. Smythe?